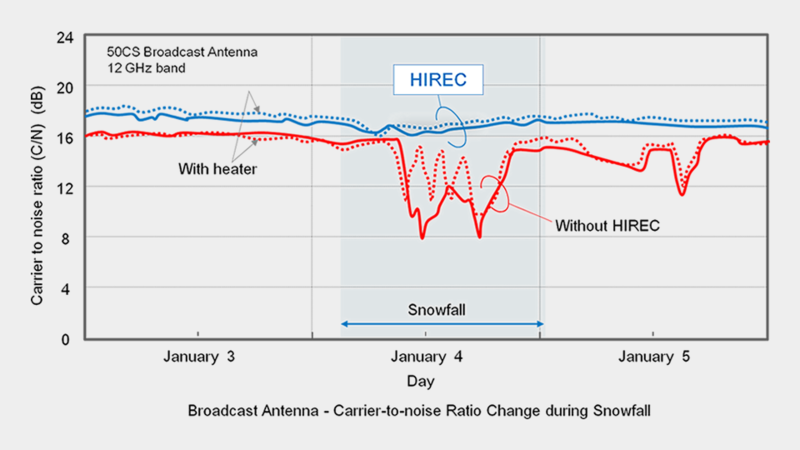 Changes in satellite broadcast reception by snowfall were measured in CS 12 GHz broadcast antennas. Four (4) antennas were set up for the test: Two antennas were coated with HIREC, and other two were not. One of the HIREC coated antennas and one of the non-coated antennas were each equipped with a heater for melting snow. - Show stable broadcast reception and no deterioration in Carrier To Noise Ratio C/N during and after snowfall. - Not much difference found between the antenna with a heater and the antenna without it. - No water film was formed on the surface of the antenna. - Show 4-8dB deterioration in C/N during snowfall. - The deterioration remained after snowfall due to remaining snow and ice on the antennas. - Even after the snow, the deterioration in C/N continued for a while due to remaining water film. - The deterioration raised again after the snow cleared, which was caused by the water film formed by melting snow. The super water repellent HIREC is the effective countermeasure for snow and ice accretion.